These tournament quality SAM snooker tables are perfect for home and commercial use. They come with free delivery & installation and a free accessory pack. Finance available. SAM are known for their high quality commercial standard games room and leisure products and their snooker tables are no exception to the rule. SAM snooker tables are a real luxury product, made to tournament standard by experts in the UK, with only the best quality materials. Snooker has been played for hundreds of years in various forms, dating as far back as the billiards games of the 16th Century. The modern game as we know it is said to have been played by the armed forces who were stationed in India in the 19th Century. There were two forms commonly played called Life Pool and Pyramid, the latter was to become snooker in the coming years. Snooker is an immersive game to watch and to play. Professional snooker players make the game look simple on TV, but anyone who has actually played snooker will know it is a game of tactics and skill, where having the correct stance and technique can make all the difference and by staying one step ahead of an opponent you can turn a game around. A traditional snooker table is made in mahogany and finished with a green cloth. Mahogany is a very expensive wood, so many tables are made with a mahogany cushion rail and the rest of the table may be made of other woods. The cushion rail is the part that is most used, so it is important to be made of the real mahogany, whereas the rest of the table may be made from such materials as plywood which is extremely strong and not prone to warping or cracking under heat or pressure. SAM’s Tagora range can be finished in the traditional mahogany, or a more modern black or silver finish. In recent years the snooker World Championships used tables with a silver finish such as the Riley Aristocrat Tournament snooker table and some Star Snooker Tables. This finish looks great when set off by a cloth in a less traditional colour such as the purple, as the centerpiece for a modern snooker, leisure or games room. Here at Home Leisure Direct we have chosen to specialise in luxury slate bed snooker tables, as we have learned in the past that it is really not worth selling cheap, MDF snooker tables as they are such poor quality and don’t last long. SAM’s fantastic range of snooker tables are crafted to the highest standard with the best and most durable hard woods to ensure that you are investing in a beautiful table that is made to last. Their classy Vintage Domestic range is customisable to suit your specific needs and to appeal to every taste. SAM provide a wide selection of styles, top quality wood finishes and cloth colours to suit and manufacture 10ft or 12ft tables to fit the size of the room you have in mind. All of the SAM snooker tables come with free delivery and installation for your ease and are accompanied with a free pack of accessories to get you started as soon as your table is fitted. Specialist installation is essential for a product of this nature, which is why we provide this free service. 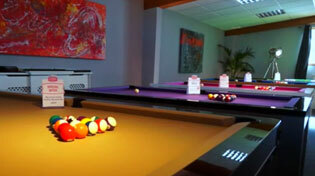 Our expert team of engineers are highly trained and have been fitting snooker tables for many years. If your intended location is up or down stairs please contact us to discuss the route and it’s measurements so we can provide you with a quote for any additional costs. If you are looking for a bespoke table, we offer a full design service where you can specify the style and wood used to create a truly impressive table. Our designers are able to visit you to receive your brief for a small fee which is refundable upon placing your order. Alternatively you can simply e-mail us, or give us a telephone call. Whatever your requirements please contact our expert advisors on 0800 622 6464 or 01454 413636, and we will be happy to help.